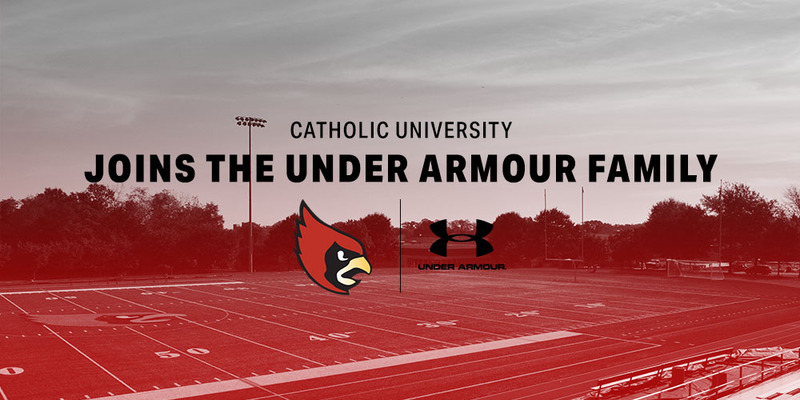 The Catholic University of America athletics department continued its progress to becoming one of the nation’s premier Division III programs on Thursday, January 17th as it announced a 5-year apparel deal with Under Armour. The deal will be effective immediately as each of the department’s 23 teams will be outfitted in new game uniforms as well as practice attire, marking the first time in Catholic’s history that all the teams will be wearing the same brand of apparel. The deal with the Baltimore, Maryland based brand was made through BSN Sports. The company specializes in marketing and outfitting for amateur sports programs from the collegiate level all the way down to local youth teams. Though no financial details have been released, the partnership is heavy with incentives for on-field performance in the form of discounts and rewards, and additional marketing and promotional opportunities. The Cards should have no issues reaching these incentives as they have held a dominant grip on the Landmark Conference in recent years. Baseball and women’s lacrosse both won their Landmark Conference Championships last season while men’s swimming and diving has been reigning back-to-back conference champion. Women’s cross country ranked as highly as 7th in the South/Southeast region. Women’s swimming and diving, men’s soccer, and field hockey all recently finished as runner ups, while both men and women’s basketball and women’s volleyball are perennial postseason contenders. Women’s lacrosse dominated last season. On top of conference title it went as far as the quarter finals in the Division III NCAA tournament, finishing 14th in the final Intercollegiate Women’s Lacrosse Coaches Association (IWLCA) poll of last season. They opened at 15 in the first IWLCA poll of the preseason. This is another aggressive step by Director of Athletics Sean Sullivan to the front line of Division III athletics, following the $2.5 million-dollar renovation to the Raymond A. Dufour Center which brought in new locker rooms and improved team training equipment. The new gear from Under Armour just further showcases the talent and championship spirit that has always been at the Catholic University of America.